it weighs nearly 3 lb. In 2018, the world gets to celebrate 50 years of America’s most beloved and original shock rocker Alice Cooper. 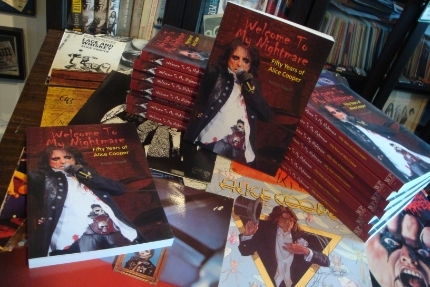 Welcome to My Nightmare: Fifty Years of Alice Cooper aims to be the most encompassing and detailed career-spanning document in book form of the event, which will no doubt feature Alice continuing to tour, as he was in 2017, playing large venues as he has virtually every year in his long career. Popoff has written this easy-reading book utilizing his celebrated timeline with quotes methodology, allowing for drop-ins on all aspects of Alice’s busy life. 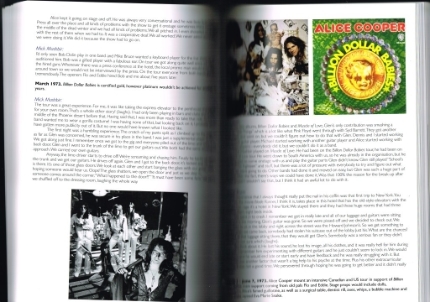 The author has made use of his extensive archive of interviews with Alice and band members through the years, as well as producers, cover artists, and even a chat about Alice’s legendary guillotine prop with its inventor, The Amazing Randi, world-renowned magician turned leader of the sceptic movement. 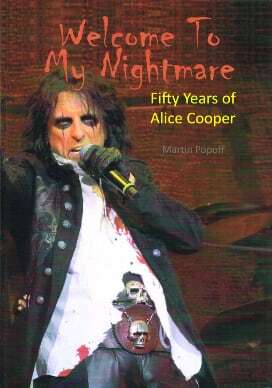 Martin also has free access to dozens more rarely seen interviews which will help fill in the gaps in the story, making the book substantively quote-intensive—Welcome to My Nightmare will be an immense addition to Alice Cooper scholarship, as have been Martin’s previous books of this nature. A little about Alice and his popularity… Alice Cooper “the band” was one of the biggest concert draws in the ‘70s, and had to their name a string of gold and platinum albums. Hits include “I’m Eighteen,” “Be My Lover,” “Under My Wheels,” “School’s Out,” “Hello Hooray,” “Elected,” “Billion Dollar Babies” and “Muscle of Love.” Going solo in ’74, Alice continued to shake pop consciousness with Welcome to My Nightmare and a string of hit ballads. He appeared on TV and talk shows often. Following a debilitating drug and alcohol addiction and subsequent notorious dark period in the early ‘80s which will be addressed in the book, Alice returned to gold and platinum status during the hair band era with albums like Trash and Hey Stoopid, featuring smash singles “Poison” and “Feed My Frankenstein.” He’s never stopped touring and being a multi-media whirlwind since—Alice, with his pioneering use of facepaint, remains one of the most famous faces in America. 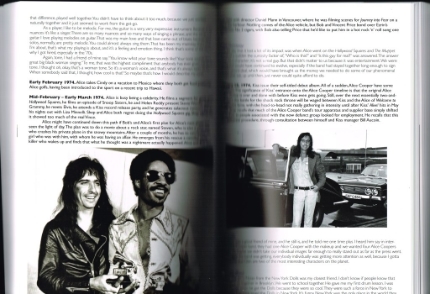 As pertains books on the subject, shockingly, there has not been a comprehensive Alice Cooper book since the ‘80s on the band, the only Alice books coming from himself as well as past band members in the form of memoires. The key here is the rich content Popoff brings to the project, Welcome to My Nightmare sure to impress the Alice expert and novice alike, with new revelations and unseen interview footage turning up page after page. And there we have it! Given the 50-year anniversary of the band, and given Alice’s continued presence on stages around the world, the time is ripe for a major Alice Cooper book. Welcome to My Nightmare proposes, with flying colours, to be that major work.